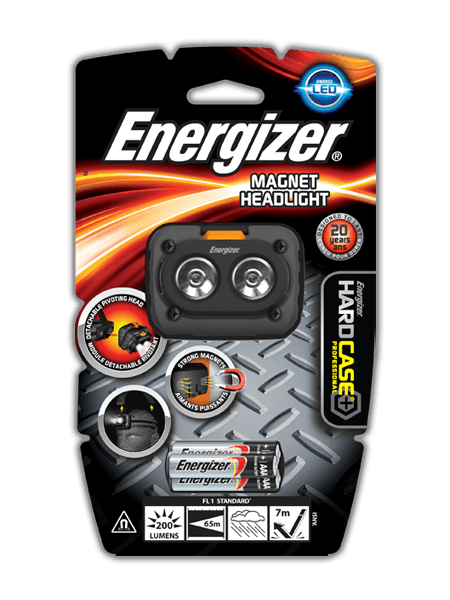 The Energizer® HARDCASE PROFESSIONAL® Magnet Headlight is designed with tool quality construction and advanced LED technology to meet the most demanding job needs. Constructed with professionals in mind, it withstands drop after drop, off a ladder or a two story building. Built to give users freedom to use both hands, this headlight provides maximum versatility. Choose the comfort and convenience of a headlight or detach and use the handy magnet to instantly mount the unit wherever light is needed. Either solution provides an impressively bright, durable companion for the job.